It doesn’t take sides. It doesn’t give you what is unwanted by you and keep the rest. It doesn’t decide if what you want is good or bad. It doesn’t discriminate. It is not capricious. It doesn’t equivocate or vacillate. It doesn’t have favorites. It’s not your mommy or daddy punishing you when you’re bad or conversely, rewarding you when you are good. It doesn’t have a conscience. It doesn’t have judgement. It doesn’t keep a check list. It doesn’t rate your vibrations, it only responds to them. And here’s the big one, it never, never-ever, never bloody well ever says, NO!!! And when you say No, how does it respond? With a resounding YES!! 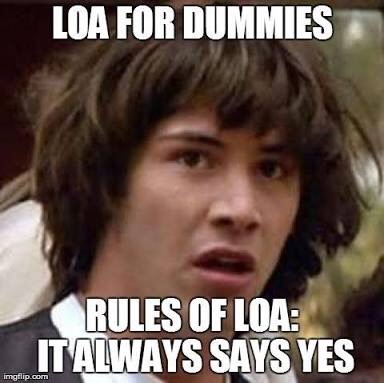 LOA has One Setting Dear Creator and that is YES! The Law Of Attraction’s ONE AND ONLY JOB is to Respond to Your Vibration In Kind. That’s it. Simple. So how do you Create a juicy feeling Life and get righteous manifestations? Stay off negative subjects, disconnect from negative conversations/people. Rather, imagine and ponder only that which is good and sweet and lovely to think and talk about. Praise! Appreciate! And then, Praise and Appreciate some more. Really it’s the simplest of formulas, don’t you think?